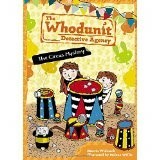 Kids love to solve mysteries and this third mystery in The Whodunit Detective Agency series is a fun one. Circus tents and balloon sellers bring excitement to town that can only be topped by a backpack wearing money who bows at his costumers. Stolen cell phones and lost wallets raise crowd tensions between shows and get the local sheriff involved. His friends and sometimes crime stopper helpers, Jerry and Maya, come to the show intent on solving it. Newly independent grade three and grade four readers will enjoy this mystery they can solve on their own to solve the crime. Clues are cleverly placed and details explained. Large font on clean white paper make the book approachable. Full color sketches keep the readers entertained and take them right into the circus tents. Readers will enjoy getting to know Jerry and Maya and will look forward to more crime solving with them in their town of Pleasant Valley as the series continues. Maps of the town as well as a gallery of characters who will appear in the story are presented in the beginning pages inviting readers to jump in and get to know them even before the story begins. Parents, teachers and librarians can get reluctant readers involved in this series by reading a chapter or two aloud. Or by using the technique, you read a page and then I’ll read a page.